Join the Becoming Limitless program with hundreds of students to ascend the level of your consciousness. Level 2 is called the ‘Thoughts Create Reality’ stage. This is where personal growth resides. Here, you start exploring new ways of showing up in the world. It’s where you discover ideas like meditation, speed learning, personal transformation, and fitness hacking. It’s when you start ascending beyond what most people are doing, and becoming extraordinary. But this is far from the highest level you can be at. 1. A feeling of connectedness with all of humanity and existence. Ideas such as religion, culture, and race no longer seem to identify with you. Rather, you see everyone as one and the same. 2. A feeling of being completely tapped in. It’s as if your intuition is on overdrive. You are hyper-creative. You know what to say and you have gut feelings guiding you towards your best possible life. You become fearless. 3. A feeling of accelerated manifestation. This is the feeling where your thoughts seem to become reality at an accelerated pace. You can think about a particular thing that you want to bring out into the world, or think about a problem you want to solve, or think about an illness that you want to recover from – all of it seems to come into fruition significantly faster. Some people say it’s almost as if you can bend reality. 4. A feeling of luck, as though the universe itself has your back. You feel connected to a higher power, and it’s as if this power is supporting you in your unique purpose. You’re happy, you’re excited, you’re living your mission and life almost always unfolds beautifully. These are the four core qualities you’ll experience at Level 3 – and the Becoming Limitless is designed to bring them to you as soon as possible. You’ll learn more about this level and the people who have reached it in the course. However, most of the course will focus on Level 3, which is where the most tangible and accessible benefits await. 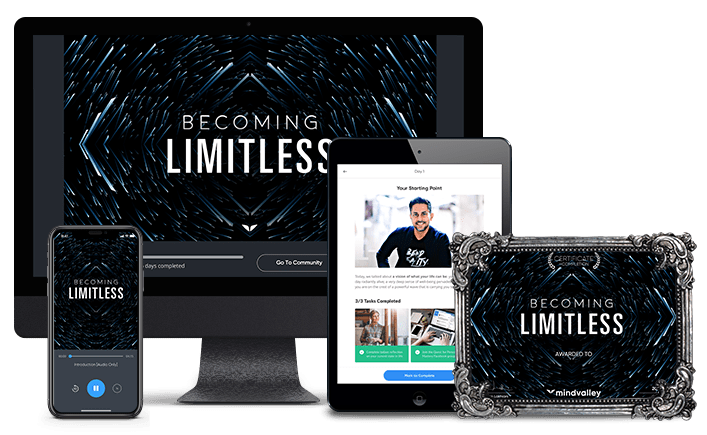 In the first module of Becoming Limitless, you’ll learn Vishen’s Unifying Model on how to escape the “means goals trap,” which most people unknowingly fall into through a lifetime of social conditioning. With this new framework for lifestyle design, you’ll discover how to adapt new models of reality, and to set bolder goals without intimidating yourself. Plus, you’ll learn how to identify and map out the perfect life for yourself, so you can start living by your own rules. How to think outside conventional rules and escape the system, so you can truly live free. How to dream bigger without fear or worry, so you’re emboldened to make massive impact in the world. How to develop a model of reality that suggests you have the ability to create “luck” and accelerate toward your goals, so that this becomes your reality, and you feel as though the universe is serving through you. Next, you’ll learn how to achieve total inner peace by harnessing forgiveness to let go of all that is holding you back. This total inner peace allows you to naturally become highly intuitive and unattached to your goals while still calmly pursuing them. In addition to that, you’ll also learn the secret technique for raising your Alpha waves to allow for abundant creative insights on demand. And enjoy a guided meditation led by Vishen on the power of forgiveness. How to let go of all the suboptimal models of reality that are holding you back from realizing your full potential. How to detach happiness from the end result of your goals so you are always in the optimal state of flow. Why “hurt people, hurt people…” and how to escape this cycle of suffering by liberating yourself from past hurts so you can be unfazed by other people’s pain and frustration. The “I’ve sent you nothing but angels…” framework for feeling supported in the pursuit of your goals, and turning setbacks into advantages so you don’t feel disappointed even when things seem like they’re not going your way. And how to raise your Alpha waves on demand for instant creative and intuitive insights to solve problems and make rapid progress. On the third module of Becoming Limitless, you will discover the concept of Blissipline. And how, when you live according to this new paradigm, you can go beyond having a peaceful inner state to having a joyous outer state. 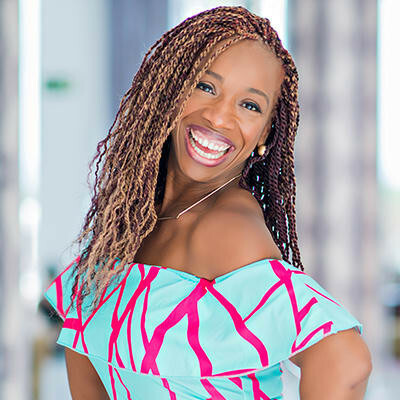 To help you experience this heightened state of being, you will learn the five systems for happiness that make up your Blissipline: active gratitude, forgiveness, self-love, the feeling that “I am enough,” and being present-centered. A daily practice to rapidly hack your own happiness levels for immediate and long-term results. How to slow down aging and improve your health, so that you look and feel incredible for years to come. How experiencing happiness in the now is the best way to achieve your long-term goals. How to control your emotional state and stay in peak performance throughout the day. How to affirm your own self-love, so your own happiness overflows into the lives of others. Here you’ll discover how to navigate your way out of downward spirals, and escape your current reality trap. You’ll learn that by experiencing happiness in the now, you can also honor your vision for the future which allows you to bypass stress and anxiety and live in flow. You’ll also discover the importance of having a mission, not a career, and learn the powerful four-step solution to mastering energy redirection. How to choose a mission, not a career, so you are effortlessly pulled toward your vision for the future. The system for living in the ultimate state of flow, so you can bypass stress and anxiety and always feel like the universe has your back. The importance of being “unrealistic” in your goals to create a balanced, extraordinary life (and not get stuck in the mediocrity trap). The four-step solution to mastering energy redirection, so you can radically transform many areas of your life. Next, you’ll discover how to tap into your innate powers of intuition. You’ll learn the five ways of using intuition: as a warning system, to connect with others, for inspiration, to support for yourself and others, and to be connected to your higher purpose. By being connected to your intuition you will easily spot new opportunities, and effortlessly navigate the path toward your vision for the future with a unique advantage that tips all odds in your favor. The five different ways of using intuition in your daily life. The four stages ideas go through before going mainstream. How to “Clear The Garbage” and become a clear channel for intuition. The models of reality that the world’s elite achievers like Steve Jobs and Elon Musk use to follow and trust their intuition to reach their higher purpose. The advanced techniques for tapping into intuition, such as “The Invisible Counsellor” and “Delta Doorway” techniques. Module 6’s primary focus is the practical science of Bending Reality. You’ll take a deep dive into shifting reality with your mind, to prepare you for the weeks to come as you approach your higher purpose. You’ll discover the four-stage framework for Consciousness Evolution, as well as the basic methods of creative visualization for healing and amplifying your results with Bending Reality in every area of life. The practical science of Bending Reality and how to create results in every area of life. The model of reality to help you navigate the four stages of Consciousness Evolution, so you can identify where you are and ascend faster. How to heal and amplify your effectiveness with unique creative visualization techniques you will not see anywhere else. How to outgrow the victim mentality, and become a servant to your higher calling. 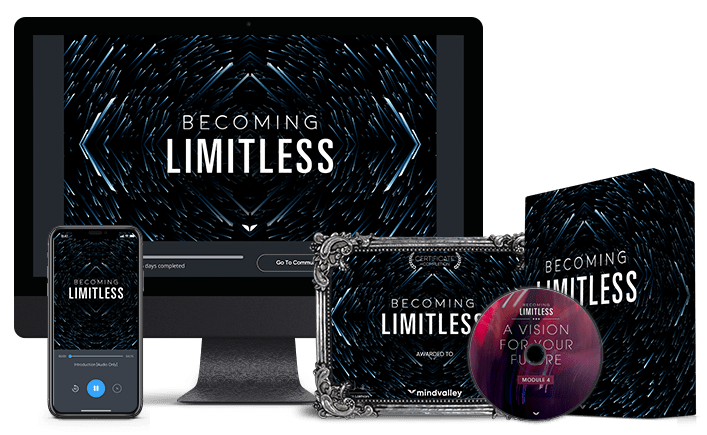 Next, you’ll make one of your biggest leaps yet toward Becoming Limitless, by learning how to consciously commit to any vision or idea – and bring it into reality by accelerating the process of conscious manifestation. Plus, you’ll discover how to use Merging: a remarkable technique for creating any outcome you want, far more quickly and consistently than if you were to just use the Law of Attraction or creative visualization. How to consciously commit to any vision and rapidly accelerate the process of it manifesting in the world. How to maintain balance and avoid the most common mistakes that keep people from reaching the state of Limitless. The concept of “Egolessness” so you can better understand how to merge with your vision. The components of Merging with your vision, as well as a guided meditation by Vishen on how exactly you can Merge and Become Limitless. In your path to Becoming Limitless, you’ll have learned multiple models for amplifying your sense of happiness, meaning, and impact. 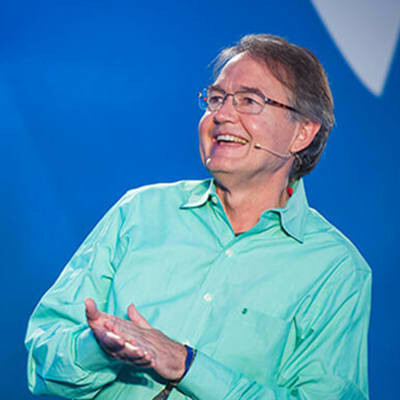 In this final module, you’ll fully embody your vision by learning the seven keys to apply in your personal and professional life to rally people around you and accomplish your vision faster. Here you learn the essentials of “culture hacking” and influencing mass amounts of people in positive ways, so you can help others advance, too. 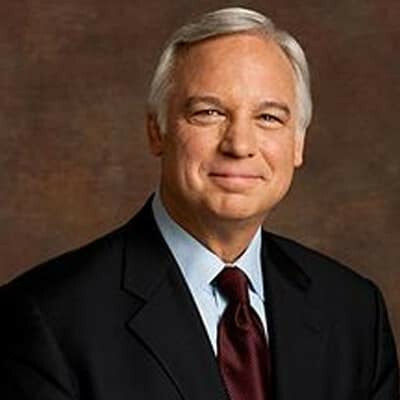 The seven keys to apply to your company, business or life to rally people around you to rapidly see your vision come into fruition. How to attract the right talent to join your movement, find the right fit, establish a common code, and help them find meaning and significance in supporting your mission. How to create advanced culture models in companies and organizations so that you create powerful, high-performing, conscious tribes. How to rally followers behind your vision for the world so that you can manifest it faster and more magnificently than if you were to do it alone. In addition to the 8 core training modules, you’ll also get a set of 8 Q&A recordings – each one featuring Vishen’s answers to the most commonly asked questions for each module. This bonus feature is a fantastic way to go even deeper into the course material, and learn from other students. How do you sustain the state of flow? How do you build your dream without losing yourself in doing too many things at the same time? What is the best way to switch states from ego to a higher consciousness? How can we bring happiness and awareness to others? How do we detach happiness from goals? How do you distinguish if it is intuition or fear and desire speaking to you? How did you strike the balance between being present and happy in the now and striving towards your future? At what age it is suitable to start introducing the evolution of consciousness, and how do we train the younger generation to create reality with their thoughts? Every moment your consciousness expands and stretches, so will your level of success, fulfillment, joy, purpose, wellbeing and contribution. And as you progress through the 8 carefully crafted modules of this program, you will feel that expansion happen deep within your being as you go far beyond personal growth ideas like positive thinking or basic motivation. Instead you’ll be exposed to a vastly different set of tools and techniques designed to take you to the next step of your evolution, awaken you to your true nature and uncover dormant faculties you never knew you had. You’ll become perpetually tapped into peak levels of intuition so you rarely doubt a decision you make. You’ll become hyper aware of how malleable reality truly is, and have the ability to bend it to your desires. You’ll become deeply connected to not just your community, your culture, your nationality — But to all of humanity itself. You’ll become fully aligned with your purpose that nothing can derail you from achieving your goals — no matter how ‘impossible’ other people may think they are. In short, you’ll become limitless. And when this happens, there is no turning back – You will never experience the world around you the same way again. That’s why we’ve made the Becoming Limitless program as affordable as possible, for as many people as possible. And what you’re getting in this powerful program is a distillation of only the best and proven methods he has discovered to rapidly accelerate you towards your own evolution in consciousness — At a fraction of the price and at a fraction of the time. This transformational experience won’t cost you $2,000, or $1,000; but just a one-time investment of $545. You won’t find this level of training for this price anywhere else. When you’re buying a car, you can test drive it. When you’re buying a house, you can take a tour of it. We believe you should have the same peace of mind with your education too – so we’re giving you up to 10 risk-free days from the purchase date to try the Becoming Limitless before deciding if it’s for you. If in this time you’re not absolutely overjoyed with your experience, contact us via our via our support center (quickest response) for a full, fast, and friendly refund. I had the opportunity to listen to Vishen and he is wise beyond his years. When he walked up on the stage his immediate presence told me that he is very engaging, brought the power of his experience to the stage and was able to communicate with everybody in the audience, captured everybody in such a way that we were totally interested from start to finish. He is bright and a smart man, he is on top of what is happening worldwide in terms of marketing on the internet and is helping people really take their products out to the market place in a way that nobody else is doing. I don’t know of one person in the audience that didn’t want to monopolize his time afterwards to learn more. He’s as bright and as smart of a young man that I’ve ever known. I am very excited to have had the opportunity to know him, listen to him and to learn from him in the future. So , thanks for all support direct and indirect. I first discovered MindValley in 2015 when I was going through a profoundly difficult period in my life. My 12 year old daughter had already tried to kill herself twice, and my marriage of nearly 20 years was crumbling. I was truly in a “Dark Night of the Soul” transition, as I struggled to find meaning in all of these profoundly difficult trials which I was experiencing. I became one of the original subscribers to Consciousness Engineering, and Vishen became my own personal Yoda… [...] Vishen’s program, Becoming Limitless, inspired me to push my boundaries and to believe that anything is possible if I really do the inner work and believe in myself and my vision. Now I have trained in person with Marisa Peer as an RTT Therapist, and I have trained with Eric Edmeades as a WildFit Coach. I look and feel better than I have in years and I finally believe that I have the skills and knowledge to really make a difference in the world and impact people’s lives for the better. [...] I am launching my own business. In my former career as a Physician, I never really felt like I had much hope. I earned more, but at the cost of my soul. Now I do what I love and I know that I have the tools to transform people’s lives for the better. Get full digital access to the entire program on your Smartphone, Your Computer, and Tablet. Watch anywhere. Get full digital access to the entire program, a certificate of completion that you get after a short assessment and we’ll also ship you the programs on CDs to your door with FREE SHIPPING. Yes, when you enroll in Becoming Limitless today, all the recordings will be made available to you immediately. These sessions will help you take what you learned in each module to new heights and help answer your biggest questions. The Mindvalley Mentoring program is designed to get you to Level 2 Reality Hacker, and continuously expose you to new ways of understanding and operating in the world. Certainly some elements of ascending levels of spirituality are there, however, Becoming Limitless takes this material even deeper and outlines a step-by-step process to get to the state of Limitless. It’s a deep dive program to accelerate your Evolution in Consciousness. Do you feel as though you’re serving your highest calling? Do you wake up everyday, feeling tapped into life and excited to get to work? If you feel as though there is something missing, this program is for you. This is an advanced program, and it’s actually quite difficult to describe in words the way you will feel once you ascend to a higher state. For this reason, if you’re on the fence we recommend you try the program out and experience it for yourself. Absolutely. Serving your highest calling and living a mission-oriented life doesn’t mean you have to be an entrepreneur, or even do things at a large scale. Contributing and serving your purpose may mean something locally, volunteering, working for a non-profit or anything else that lets you serve your highest purpose. The program will begin shifting your beliefs about reality from the first module. Likewise, all of the exercises you’ll be doing will change your emotional, mental and energetic state instantly. Broader life changes will come over time as you ascend to the state of Limitless, but as you can see from the feedback above, students going through this course are experience profound shifts in their lives faster than they ever thought possible. If for whatever reason you don’t get results from this program, you’re entitled to a 100% refund of your money within 10 days. No questions asked, no hoops to jump through, just a simple email to our world-class customer support team. After learning creative visualization, I practised to solve my health problem, which is being overweight. After 4 months of practising with exercise, I have lost 17kg from 103kg to 86kg and my body figure has totally changed. I really appreciate the Becoming Limitless course. It changed my life. I am now started to use merging technique and it shows result faster. My life is more meaningful. I feel growth in every aspect of my life. My finances, body health, relationships and career totally changed. I also attracted my girlfriend now in my life and now my life is surrounded by love. Body health is the first thing I had changed and it’s the most prominent we can see. I also practiced The 6 Phase Meditation daily and it makes me better in life. The 3 most important questions also makes my life clearer. Since then, I’ve experienced some huge shifts. Things I’ve been trying to implement within my business are now moving forward [at] full speed. I’ve gone from being a one-person business to a new one emerging with a team of five and complete clarity on the big vision that’s driving everything forward. There’s a huge shake-up going on with all the things that haven’t been working and I’m announcing my change of direction in under two weeks time. Have been struggling with this all year and now boom — it’s all emerging. I would like to thank you for all you have created with Mindvalley and for putting together the (Becoming Limitless) program. Having been a follower of Mindvalley for a few years now, I can say that for me it meets that need to look further for answers so that I can grow and contribute in a meaningful and satisfying way. I feel that I have been waiting for just this inspiration and guidance to gain more clarity as to how I can be part of the positive global change that needs to occur, so the synchronicities are not a coincidence. … Thank you for the opportunity to connect and I look forward to growing with Mindvalley in the future. I have just completed the Becoming Limitless program. It’s a fantastic collaboration of knowledge. The strange thing is the way that Vishen presents it, it comes across as if the student already knew the material and he is just finding a way to extract it. I was blown away by the ease of understanding and the way Vishen makes everything so simple! I’ve been studying personal development and self improvement and meditation for years and it hasn’t given me as much as this program has…its so practical and the processes are easy to follow. This program was my missing link. 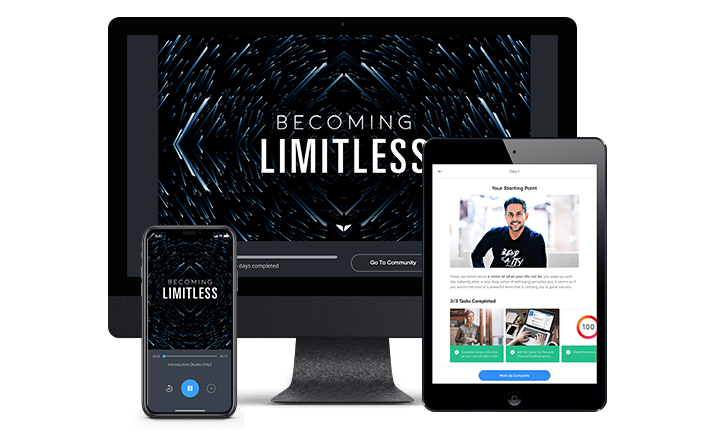 Those of us who seek enlightenment, desire healing, or simply want to live a graced life free from fear and worry – the (Become Limitless) platform is the gateway. I found the forgiveness practice has been life-changing. I use it weekly and have been sharing it with others every chance I get. I think this is something so simple and yet so often overlooked. There is so much that we hold onto and carry around with us for the single reason that we haven’t forgiven either ourselves or someone else. The amount of energy this practice frees up is amazing — I have experienced so much more freedom from this one simple technique. Through Vishen’s program I reconnected to my voice, my confidence and my purpose. It’s because of the (Become Limitless) program that I learned what I needed to do in order to break free of these harmful patterns, step into my own power and chose empowerment and myself. One of the best lessons Vishen taught me was to choose my mission over my career, and my mission is to connect people with information that serves them. Once I identified that mission, I became unstoppable. I feel completely empowered, renewed and full of life force and I would say that it all started with taking this journey with Mindvalley and (Become Limitless). I am so grateful to Vishen for what he has offered to us, for all the knowledge he has shared with us and for the time he has spent with us. The work you are doing at Mindvalley is revolutionary. I am so very grateful for Vishen’s mission. Through this course (Becoming Limitless), his enthusiasm for higher learning, and his passion to share it with the world, has enriched my life immeasurably. Vishen so generously shares his distilled thoughts from some of the world’s wisest teachers and then gives us resources to explore if we want to go deeper into the subject. Through this, I have been exposed to many concepts and practical, day to day methods that I would never have even been aware of and because of this, I am reaching my full potential. I am so much happier! Thank you! I have completed the “Code of the Extraordinary Mind” book and I am currently working on Becoming Limitless course. I have particularly liked the 6 Phase Meditation and the Forgiveness Exercises. I have been setting my vision for my future to have loving relationships, adventure and luxury travel experiences with my children. This is starting to come true, I have a meeting with a travel agent today. 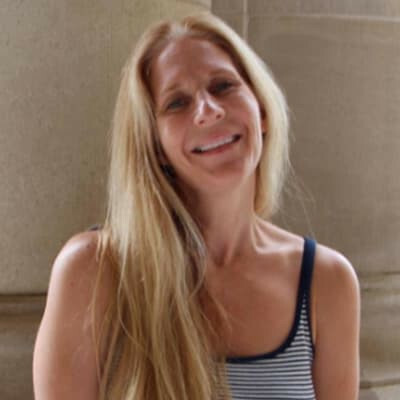 I am self-employed working as a Rebirthing Breathwork facilitator full time and I have blown away from the power you can get from conscious breathing. But the course Becoming Limitless is amplifying all my previous knowledge and exercises enormously. I like the way of explaining things with the words (in the way) that a 21st-century human can understand. The simplicity of the content. Of course – the value of the content and how important it is to understand. Breathwork + Mindvalley stuff is BENDING REALITY! Combining breathwork and these lessons you literally bringing yourself to cosmos! I am also using some of the ideas in my practicum working with clients like the “The 3 Most Important Questions” and “The 6 Phase Meditation!” My clients find it awesome! A lot of stuff I have known from before, but I am taking this course very slowly and trying not to fall into the trap called “I know that” – suggest for others to be aware too! I’m [making] time each day to listen to [Vishen’s]. I take notes and read them while flowing through my day. I see and feel the genuine truth in his lessons. As a result of all of the above, I’ve moved further with my projects than for the previous 7 years. It was just 6 months. ALL of the above would not happen if I didn’t stumble upon Vishen’s PROGRAMS, TALKS and WRITINGS.